Update: Globalist rag, Foreign Policy has just published an article interviewing Thaksin Shinawatra's paid globalist-liar Robert Amsterdam regarding his claims that the July 3rd, Thai elections will be "stolen." It should also be noted that Amsterdam has also filed a petition with the entirely illegitimate, Fortune 500-serving International Criminal Court against the Thai government - all standard features of a globalist hit in action. Amsterdam, whose firm Amsterdam & Peroff populates the Fortune 500-lined globalist Chatham House, also invoked the engineered "Arab Spring." Foreign Policy reported, "Amstedam also drew parallels between the Thai opposition and recent developments in the Arab world, saying that the Red Shirts "see themselves as the beginning of the Jasmine Revolution" and wondering why the United States continues to provide support to a military whose "only successes seem to be against unarmed civilians." He also accused the Western financial press and business interests of accepting the Thai government's demonization of Thaksin and the Red Shirts." Of course this is verbatim, the same rhetoric that proceeded and followed the initial phases of the Arab Spring before widespread admissions were made revealing the entire revolution was meticulously planned and funded by the West years in advance. It would turn out that not only was initial support for the various embattled regimes feigned, but it was feigned for the specific purpose of obfuscating US funding and support for the various uprisings. The New York Times says it best in their article, "U.S. Groups Helped Nurture Arab Uprisings" where they state, "as American officials and others look back at the uprisings of the Arab Spring, they are seeing that the United States’ democracy-building campaigns played a bigger role in fomenting protests than was previously known, with key leaders of the movements having been trained by the Americans in campaigning, organizing through new media tools and monitoring elections." So Amsterdam, preying on the ignorance of anyone still laboring under the delusion that the "Arab Spring" isn't an admitted US-backed campaign of destabilization, is attempting to establish an identical, incredibly disingenuous narrative on the eve of unrest in Thailand. Rhetorical stage set by globalist Robert Amsterdam to destabilize Thailand. May 16, 2011: Globalist-stooge Thaksin Shinawatra runs his own sister in his place for Thailand's July 3, 2011 elections, as he hides in Dubai, evading a two-year prison sentence for corruption. June 21, 2011: Globalist lawyer Robert Amsterdam, representing Thaksin Shinawatra, already claiming Thialand's July 3rd, 2011 elections will be "stolen." June 23, 2011: Wikileaks hit piece on Thailand penned by former-Reuters journalist Andrew Marshall released just days before the Thai elections. June 27, 2011: CFR hails Wikileaks hit piece as a possible impetus for Thailand's total "political meltdown." Bangkok, Thailand, June 30, 2011 - Having reported on the engineered "Arab Spring" since January, the Land Destroyer Report has attempted to accurately reveal the inner workings of foreign-funded "color revolutions" drawing both on first hand experience here in Thailand, and by sourcing the exemplary work of geopolitical analysts like Dr. Webster Tarpley and William Engdahl. Having amassed a considerable amount of insight on this phenomenon, the Land Destroyer Report believes an "Asian Summer" is imminent and that it will start right here in Bangkok, Thailand. It is unlikely that the Thai government is unaware of the totality of what it faces, and thus most likely prepared, with the "Arab Spring" in hindsight, in unpredictable ways difficult to discern. What is certain is that the stage is now fully set with a Tunisian-Egyptian-style Wikileaks hit piece circulating through the corporate-owned media, and now the foreign-backed opposition party already attempting to decry the elections as "stolen," just as Egypt's Mohamed ElBaradei did prior to Egypt's 2010 elections and then revolution. All that can be done now is wait and see how the July 3rd, elections this Sunday play out. The Land Destroyer Report will attempt to cover these events in full detail, and while "Thailand" may not be a subject of interest to many readers, the repercussions, especially regarding China most definitely will affect everyone. While Egypt's revolutionary leader Mohamed ElBaradei attempts to fashion himself as an outspoken critic of Western, and in particular US foreign policy, the fact remains that ElBaradei himself sits upon one of the very US corporate-funded think-tanks making such policy. ElBaradei is also a vocal critic of Israel, even threatening to go to war with the nation recently - certainly for show however, as across the International Crisis Group's round table from him sits ICG advisers like Israeli President Shimon Peres, Shlomo Ben-Ami, Former Foreign Minister of Israel, and Stanley Fischer, Governor of the Bank of Israel. So it should not then be surprising that ElBaradei led a US-funded revolution against Hosni Mubarak's government and is now poised to take over as Egypt's leader while his corporate backers prepare to fold Egypt's economy into their Wall Street-London "international order. ElBaradei had returned to Egypt a full year prior to the "spontaneous" "Arab Spring" to begin building a political front as well as an army of street activists to contest the inevitable election results. Surely a man working so overtly for the "international order" with an army of foreign-funded, US-trained political cannon fodder would never be allowed to win an election no matter how many votes ElBaradei's front was able to garner. Fully expecting such a loss, ElBaradei and his backers had long in advance prepared to call the elections "stolen," and with that battle cry, it became the excuse for taking to the streets, destabilizing, and toppling the Egyptian government. Mohamed ElBaradei's despicable treason can find its analogue in Thailand through globalist-stooge Thaksin Shinawatra. 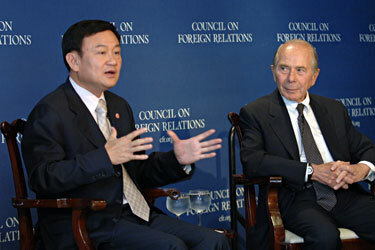 Before becoming prime minister in 2001, Thaksin served as an adviser to US equity firm, the Carlyle Group which included the Bush family, James Baker, Frank Carlucci (formally of the National Endowment for Democracy), all while holding public office as a politician in the Thai government. His time in office as prime minster, from 2001-2006 included a 3 month "war on drugs" that saw 2,500+ extra-legal executions carried out across Thailand and a 2004 attempt to ramrod a US-Thailand FTA through without parliamentary approval. His term as prime minister was cut short by a September 19, 2006 military coup which ousted him from power, on the eve of which Thaksin was reporting to the globalist Council on Foreign Relations in New York City. Photo: Thaksin Shinawatra reporting before the Fortune 500-funded Council on Foreign Relations on September 18, 2006, the eve the Thai military ousted him from power in a peaceful, orderly coup. Since then, Thaksin has been represented by the global monied-elite via their lobbying firms including Kenneth Adelman of the Edelman PR firm (Freedom House, International Crisis Group, PNAC), James Baker of Baker Botts (CFR, Carlyle Group), Robert Blackwill of Barbour Griffith & Rogers (CFR), and Robert Amsterdam of Amsterdam & Peroff (Chatham House). Additionally, media organizations within Thailand supporting Thaksin's political movement receive direct funding from the US government via the National Endowment for Democracy, including outfits like Prachatai. Thaksin has also led two consecutive attempts to violently seize power back via street protests in April of 2009, and again in April and May of 2010. 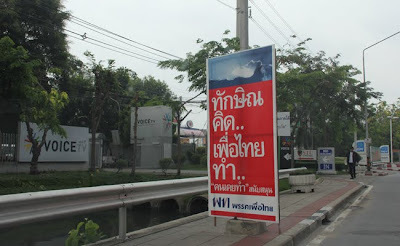 In 2010, Thakin's street movement dubbed the "red shirts" employed professional militants to balk any attempt by the Thai Army to disperse the mobs. Weeks of gun battles, grenade attacks, and widespread arson, looting, and rioting followed, leaving 91 dead. Despite Thaksin's "red shirt" leaders themselves admitting that armed militants intervened on their behalf, and one leader, renegade general Khattiya Sawasdipol known as "Seh Daeng," even admitting to leading 300 armed men trained for ''close encounters'' and carrying M79 grenade launchers, to this day the movement blames the deaths entirely on a government initiated "massacre." Leading the accusations of massacres, illegitimacy to rule, and now accusations of a premeditated conspriacy to deny convicted criminal Thaksin and his proxy party led by his own sister a victory during the July 3, 2011 elections, is paid-liar, Robert Amsterdam. "There is some dispute about whether there is any such thing as “vote buying”— in other words, whether giving a voter a small sum of money really earns a candidate or party that voter’s support. Aside from the impossibility of ascertaining what anyone does in the voting booth, voters in many constituencies often accept small cash gifts from the representatives of multiple candidates. However, there is no doubt that money plays a big role in Thai election campaigns, especially as candidates from various parties attempt to enlist the services of the most influential canvassers at the local level. Canvassers, in turn, use a portion of what they receive from the candidate as “walking around money” to pay for the campaign’s expenses and sometimes distribute the money to prospective voters. While both practices are illegal, they remain widespread and practiced widely by the Democrats themselves." Such arguments attempt to whitewash the fact that Thaksin has built his entire support base by handing out fistfuls of cash in both socialist handouts and outright bribes come election time. Amsterdam expects his audience to believe that handing out cash around election time is entirely innocuous, and even if it isn't, the Thai government does it as well. Ultimately Amsterdam's complaint is that since the ruling party buys votes as well, his client's proxy political party should not be held accountable for their crimes. Amsterdam might recognize this as the same sort of double standard the "international order" whom he and his client Thaksin represents, applies around the globe. For example, while the US has strafed Afghan and Iraqi civilians from the air for nearly a decade now, the mere implication that Libya's Qaddafi was doing likewise to US-backed terrorists in Benghazi earned Libya a referral to the UN Security Council and NATO's own campaign of strafing Libyan civilians from the air. Unfortunately, Amsterdam's proposed version of reality exists divorced from the fact that his client Thaksin Shinawatra is a convicted criminal facing 2 years in prison who has spent his time since 2006 consorting with foreign governments to destabilize Thailand through violent street protests and coordinated media campaigns - the latest of which is gravitating around former-Reuters journalist Andrew Marshall's dubious Wikileaks-based "Thai Story." It would be unimaginable to allow Thaksin and his armed band of foreign-subsidized thugs to seize back control of the nation after battling troops and murdering people in the streets for the last 2 years, burning down buildings (2010), and threatening a "people's war" (after 2009 riots) - just as it was unimaginable to allow overt US-stooge Mohamed ElBaradei to walk away a winner in Egypt's 2010 elections. The legitimacy for Thaksin and his proxy opposition party "Peua Thai" to even run in Thailand's 2011 elections is difficult to fathom, considering his criminal conviction and his overt dealings with foreign governments against his own nation. For those who attempt to portray Peua Thai and the "red shirt" movement as removed from Thaksin Shinawatra, one should know that his campaign slogan this year is, "Thaksin thinks, Peua Thai does." Photo: Thaksin's proxy political party, "Peua Thai," led by his own sister sports the slogan, "Thaksin thinks, Peua Thai does." While Amsterdam argues that the elections will be stolen from his fugitive client, there are obvious concerns over his legitimacy to contest the elections in the first place. Amsterdam's attempt to accuse the Thai government of "stealing" an election from his fugitive client is nothing less than an attempt to obfuscate the fact he has no legitimacy to run in the first place, and no possibility of returning to power after the myriad of treasonous, murderous crimes he has committed since his ouster in 2006. Just as with Mohamed ElBaradei, a man with no legitimacy himself, the global-elite must lend legitimacy to Thaksin Shinawatra, a task done by Robert Amsterdam and the corporate-owned media that will soon be extending their completely disingenuous coverage to focus on the imminent unrest about to grip Bangkok. The Asian Summer is about to begin, and it will start in Bangkok, Thailand. Thailand is a nation of over 70 million people, with a large agrarian and manufacturing based economy and a formidable military - very similar to Egypt's stature in many ways as a regional crossroads. Just as in Egypt, the Thai military has received a substantial amount of money from the US over many years, and as explained in the corporate-funded Brookings Institution report, "Which Path to Persia?" such money is expended with the hope of cultivating officers aligned to US interests who will perform on their behalf in a moment of instability and uncertainty. While Thailand's last military coup acted against the global-elites' interests, the next one may or may not, depending on who's behalf they intervene on. Thailand's military is far from homogeneous, and loyalties are divided. Following July 3rd's election in Thailand there are several possible ways Thaksin's foreign-paymasters may attempt to destabilize and topple the current Thai government. As explained in "Which Path to Persia?" it is most likely that all of these options will be used in tandem to create "helpful synergies." Street protests led by Thaksin's political lackeys inside of Thailand, coupled with a coordinated media campaign by the corporate-owned Western media, possible defections within the Thai military's ranks, and violent militants targeting both protesters and security forces alike to escalate the violence beyond a point-of-no-return are all likely scenarios Thailand should consider and prepare against. Thailand has often been cited as a gateway into China. Indeed a proposed rail system connecting Singapore to China will pass through Thailand, while ports along Thailand's rivers connect Chinese and Thai traders with each other, as well as to the Gulf of Thailand. The Kra Isthmus located in southern Thailand holds the prospect of being made into a canal that could serve as a short-cut for Chinese ships to and from the Middle East and beyond. Destabilizing Thailand, or better yet, installing an indebted stooge like Thaksin Shinawatra, would allow the Wall Street-London "international order" to once again use Southeast Asia as "Lilliputians" to tie down China's "Gulliver." Note: It is interesting to note that Amsterdam is also concurrently defending Russia's Mikhail Khodorkovsky who is now lodging in a Siberian prison for embezzling money, breathtaking displays of corruption, and his connections with the West, in particular with Henry Kissinger and "Lord" Jacob Rothschild who were sitting on what geopolitical expert William Engdahl called a George Soros Open Society-styled "Open Russian Foundation." Khodorkovsky, like Thailand's Thaksin Shinawatra, was attempting to consolidate power while handing over his nation's resources and institutions to Wall Street and London's banks. For more information on Robert Amsterdam, please see "Globalist Page: Robert Amsterdam."